Hatters attacker Harry Cornick is benefiting from finally having a place he can call home according to Town boss Nathan Jones. 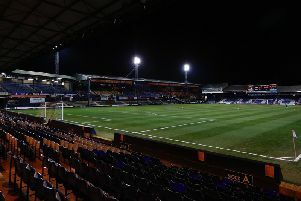 The 23-year-old had spells on loan at a whole host of clubs while at Bournemouth, including stints with Leyton Orient and Yeovil Town, but since moving to Kenilworth Road permanently in August 2017, has now made over 50 appearances. We gave him a home and now he’s maturing into a wonderful, wonderful player. He scored his seventh goal, and second in successive home games, during the 3-2 win over Scunthorpe on Saturday, as Jones said: “What people tend to forget, they see negatives all the time, someone like Harry Cornick, we’re developing Harry Cornick. “Harry Cornick’s been a right winger all his life and he’s been a young journeyman to be honest with you, as he’s never had a home. Although Cornick missed two excellent chances to put the result beyond doubt in the second period at the weekend, Jones knows it’s not just the former Cherries’ attacker who could improve his finishing. He said: “I went to Wembley (for Spurs v Barcelona) and there’s only one person in the world whose goals to chance ratio is out of this world and it’s Messi. “He put in a performance when he wanted to turn it on, he could. Now everyone else is probably a mere mortal compared to that. “James Collins had two real good chances that he needs to do better, but we’re creating chances, we’re a positive side and that’s what I look at. The Luton chief knows that they won’t be able to sweep teams aside as they did on their way to promotion from League Two, such is the higher standard of opposition this term. However, he feels that any thoughts his side are struggling in front of goal are way off the mark, adding: “It’s just to add the finishing touches, but if we had taken all our chances and scored the ones we should have against Charlton, we’d have won that by five. “We’d have won by five today (Saturday) and suddenly you’re winning games by five and that’s not always possible. “Bear in mind, we’re saying we’re not clinical, we’re not composed, but we’ve scored seven in a week, there aren’t many who do that. “We’ve taken seven points, we keep creating, if someone said to me you’re going to score three every game from now until the end of the season, I think I’d probably take that.